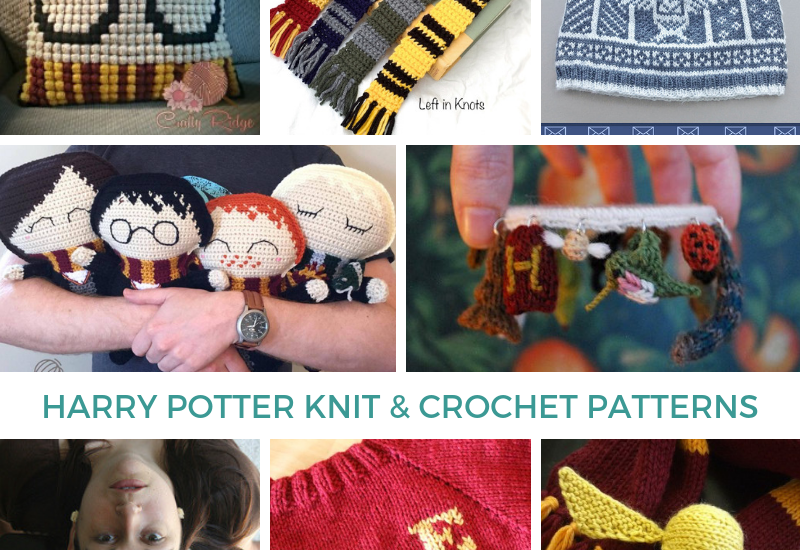 In honor of Halloween I decided to do a roundup of my favorite Harry Potter patterns, both knit and crochet, since (in case you didn’t know) I’m a huge Harry Potter fan. If you, like me, can’t get enough of the wizarding world, cast on a couple of these! 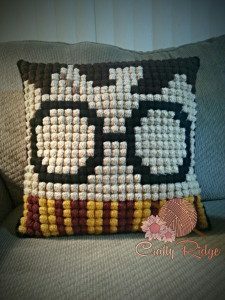 What’s cozier than snuggling up with this Potter Pillow by Crafty Ridge? It has Harry’s face on the front and the Hogwarts crest on the back! 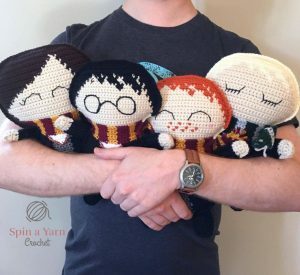 Or if you prefer a different form of cuddly, try the Ragdoll Harry Potter by Spin a Yarn Crochet! You can make Harry or any (or all) of his friends! Just want to keep your place in one of the books? 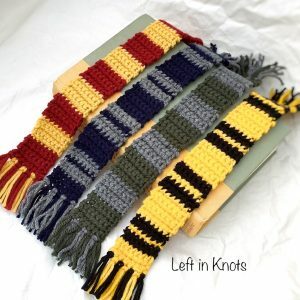 Try the Harry Potter Inspired Bookmarks by Left in Knots. Who doesn’t love Quidditch? 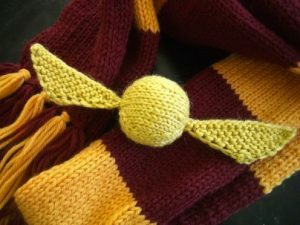 Check out this Golden Snitch by Just Crafty Enough! How cute is this Care of Magical Creatures Charm Bracelet by TinyOwlKnits? Display your wizard side and your expert knitting side! I actually knit the Hermione Hearts Ron Hat by Christy Aylesworth 6 or 7 years ago and have been wearing it as my primary winter hat since then. 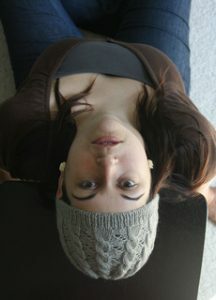 It looks like a super cute muggle hat while being secretly nerdy at the same time. Have a child who loves Harry Potter? 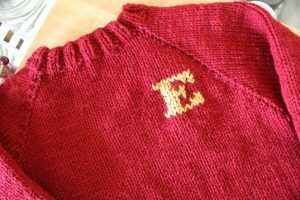 Knit a Weasley sweater (in 1 day!) with this guide from A Modern Homestead. 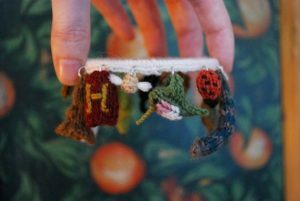 Want a Weasley sweater but don’t have time to knit one? Check out Lauren Fairweather’s tutorial on YouTube for how to turn a muggle sweater into a Weasley sweater! Looking for a pattern for a classic Hogwarts scarf? 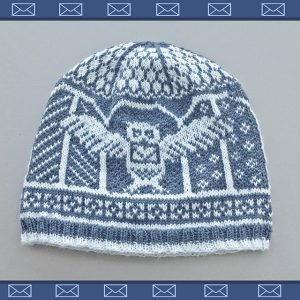 This is one of the better, more straightforward patterns I’ve found, and it’s on a Harry Potter fan site, not a knitting site! Penguineer’s Purls put together a chart for Ron Weasley’s patchwork blanket that could be either knit or crochet—I think it was originally knit in garter stitch squares, but you could also do single crochet squares if that’s more your thing. Take a look! Still need more patterns? Check out the book Charmed Knits: Projects for Fans of Harry Potter by Alison Hansel and the Unofficial Harry Potter Knits magazine from Interweave Press. Have an awesome Halloween fully of wizardy goodness!